When trying to find a new job, it is not enough to have an impressive work history. You may compete with hundreds of other candidates for the same position, so you also need to have a resume that sets you apart from other applicants. Before you begin writing your own resume, you may want to review samples from your field for inspiration. Our experienced nurse resume templates contain useful tips for making your past work shine. Your resume should have both strong content and attractive presentation. Recruiters may not give your application a second glance if they dislike its style. Our resume templates help take the guesswork out of formatting, making it easy to choose a layout that appeals to hiring managers and emphasizes your professional accomplishments. Why Use Experienced Nurse Resume Templates? 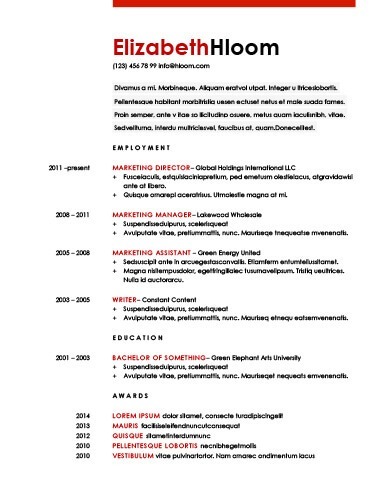 Hiring managers have a lot of applications to sort through, so the visual appeal of your resume carries a lot of weight. In some fields, a creative resume could make a strong impression, while a classic resume may be a better fit in other situations. Whatever style you choose, most hiring managers agree that the ideal format is one that supports your accomplishments rather than obscures them. If your work history is not so cut and dry, then a functional resumecan help you emphasize your skills and versatility rather than focus on the timeline of your career. Resume templates can be especially helpful in these situations, since they provide guidance on where and how to place your information. In fields such as healthcare and medicine, it is hard to go wrong with the classics. Traditional experienced nurse resume templates have timeless lines and consistent formatting that indicate respectful professionalism. Modest color schemes and calm font choices can go a long way toward getting and keeping employers’ attention. These clean templates bring to mind the crisp white nurse’s uniforms of previous decades. The intent of the design is clarity and readability, enabling your readers to immediately focus on the essential information. Simple fonts nestle against ample white space. If you wish to add some personalization, you can also add small splashes of color. According to the U.S. Bureau of Labor Statistics, the nursing field should see a growth rate of 15% over the next decade, a much faster rate than average. As new healthcare facilities open their doors, there may be times when it is important to project a modern persona during your job search. Our contemporary experienced nurse resume templates can help you show you are ready to keep up with cutting-edge research and technologies. When you have a lot of experience under your belt, you have a right to do it justice. Chronological resumes help employers understand how your career has progressed over time, so they are ideal for experienced jobseekers who have generally stayed in the same field. The intention of these experienced nurse resume templates is to help you present your work history in a way that is easy to digest. Name: Use your full name to appear as professional as possible. Location: You can include your mailing address if you want, but it is acceptable to include only your city and state. Email Address: Keep your email address simple; something like [email protected] should suffice. Phone Number: Use reliable phone number with a professional voicemail message. Website: If you have a LinkedIn profile or a professional website, include a hyperlink. Use an objective statement to mention your major skill sets. Ideally, these should strongly relate to the position at hand. Use strong action words to explain your past work duties. For example, you should say "Coordinated daily operations" rather than "Responsible for coordinating daily operations." Use specific figures to indicate the impact of your work whenever possible. For instance, you could say "increased profits by 15%." Use only four to six bullet points for each position. Employers know you are talking about yourself, so you can omit pronouns to save space. Degrees: List the degrees you hold and the institutions where you obtained them. Qualifications: If you have relevant certifications or training, list them in this section. Your resume is your passport to employment, and you do not want to miss out on an excellent opportunity because your document is incomplete. A resume builder can help you cover all your bases, from formatting to content. * Choose from a vast selection of formats and layouts. * Access your materials from multiple devices. * Tailor your resume for various positions. * Find helpful writing tips. * Create strong cover letters. * Check for errors before you send your documents. The process is as easy as one, two, three, so there is no time like the present to get started.